Get notified of activity right from your Slack workspace. 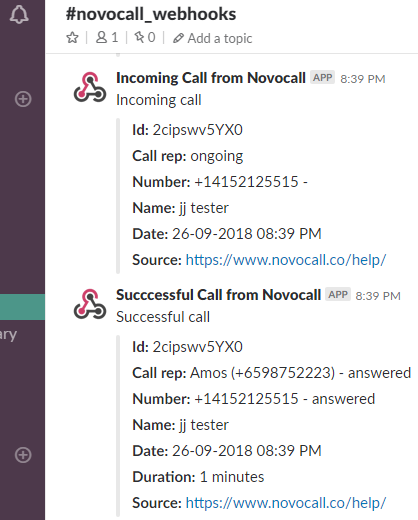 Interested in integrating your call activity in Novocall with your Slack workspace? With Slack webhooks, you can send automated notifications of activity straight to your specified workspace & channel in real-time. No more toggling between applications to stay on top of everything! Go to Slack's Incoming WebHooks page > Click on Add configuration. Find your Slack app's Webhook URL, and copy it. With your webhook URL in hand, head on over to the Novocall Dashboard to finish setting things up. 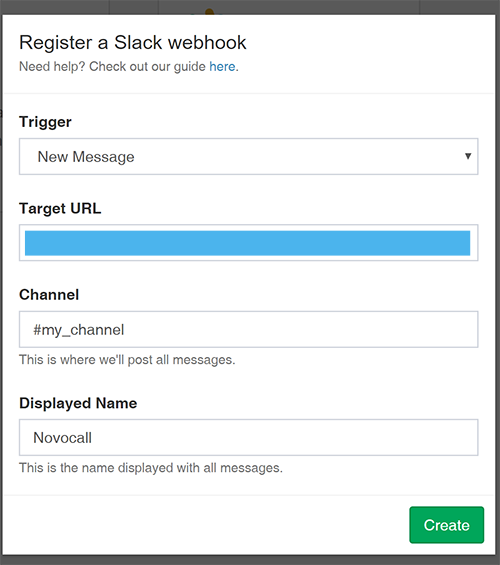 Click on the Slack card to register a new Slack webhook. A form should pop up. (i) Event - There are 5 types of events: Incoming call, successful call, failed call, new message, new scheduled call. When this event occurs, our system sends a message with the trigger's data to your Slack channel. (ii) Target URL -Paste the webhook URL you've previously copied. *Do check that you've used the right URL- we don't want to send your call data to the wrong workspace! (iii) Channel & Displayed Name - Finish up the process by specifying the channel you'd like us to post messages to, along with the name that would be displayed on each message. Once you've filled everything up, go ahead & click on Create. This is where the magic happens! 6. That's it! Check your Slack Channel. You've just registered your first Slack Webhook with us! Check your channel to see the notifications coming in. Pro Tip: Check out Integrations > Overview > Registered Slack Webhooks to see all your registered webhooks. You can edit & remove existing Slack webhooks right there! Want more information? Check out the Slack API docs here.